I would not have known when the first toads started calling in my neck of the woods if it weren’t for that drunk taking out a neighborhood mailbox. My wife and I were awakened at 5 am by the sound of a careening truck in the process of obliterating my neighbor’s mailbox and it’s supporting post. The catastrophic sound sent us both jumping for the ceiling. The vehicle, unfazed by the obstruction through which it had just passed, came to a rolling stop in the middle of their yard. By the time I pulled on a pair of shoes and ran out to investigate, the culprit was long gone. Only the poor decapitated box, centered within a pair of tire tracks, remained as evidence of the deed. It was there, while standing in the pre-dawn darkness, that I slowly came to hear the distinctive sound of calling toads drifting in on the warm breeze from the adjacent farm field. Since there was nothing more that could be done about the vehicular posticide, I was able to pause and enjoy the sweet sound of distant toads. As it turns out, I heard a whole lot of toad music over the next few days, but I can thank that inebriated fool for providing me the opportunity to hear the very first trilling notes of the season. 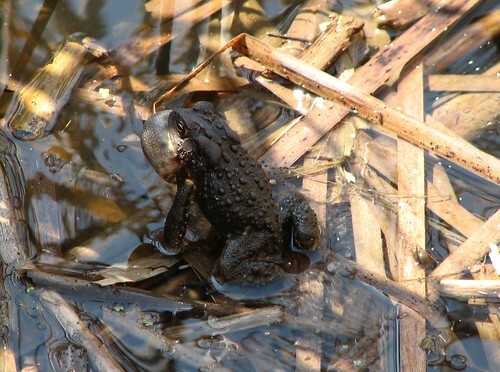 The breeding call of the American Toad (see a non-calling toad below) is a peculiar mid-spring sound. From a great distance away, it rides the air like a soothing background chime (listen here). From 500 feet away, the quality begins to take on a mass alien invasion feel (listen here). When performed within a few feet, the call is downright deafening…I said…d.e.a.f…..what? (listen here). Any way you hear it, however, the sound is not one you’d expect from something as earthy and serious looking as the American Toad. 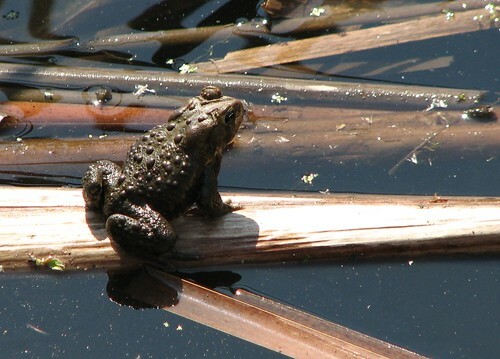 These bumply amphibians begin the migration to their ancestral ponds in mid- to late April. The males stake out singing territories in the shallow waters of a marsh, semi-permanent pool, or a pond. There they proceed to blow each others ears out in an attempt to lure in the females. A few hours following the “bottle meets box” incident, I came upon a host of breeding toads gathering in a Lake Erie marsh. During the peak calling period, toads will call day and night until the job is done. Fortunately, these day-time callers provided an opportunity to both see and hear the big event. 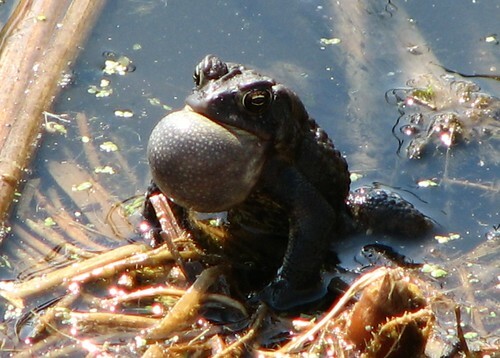 Like all frogs, toads amplify their call via an inflated throat sac (see below). The throat is distended by a few breaths just before the sound is issued and the trilling noise is produced by multiple passes of air over the vocal chords (watch the video here). During the actual calling sequence, which can last up to 20 seconds, the critter appears to be motionless – the throat sac and sides quivering only slightly. The collective effect produced by a load of loud male toads increases the overall impact of the effort. Individually, the toads are able to signal their sexual readiness, position, size, and – of course – their species identity by subtle variations in their calls. The females, which are mute in this affair, answer these advertisement calls by seductively approaching the callers and allowing them to “prove their prowess.” The end result of all this will be a string of eggs several dozen feet long containing up to 15,000 eggs. I was giving a nature presentation to a family group on the day after my rude awakening (which was probably about the time the guilty mailbox killer was getting over his headache) when I brought up the subject of spring amphibians. During the ensuing question period, one gal posed a question. “I just started hearing a loud noise a few nights ago,” she stated, “I think is might be a bunch of insects -’cause somebody told me that there was some kinda new insect out there that is really loud. Do you know what it could be?” After a short give and take, I was able to tell her that she was hearing the sonorous voice talents of the lowly toad. It seems that these creatures were really painting the town this past weekend, along with at least one errant human.